How Likely Is To Appear On YOUR Bar Exam Essays? 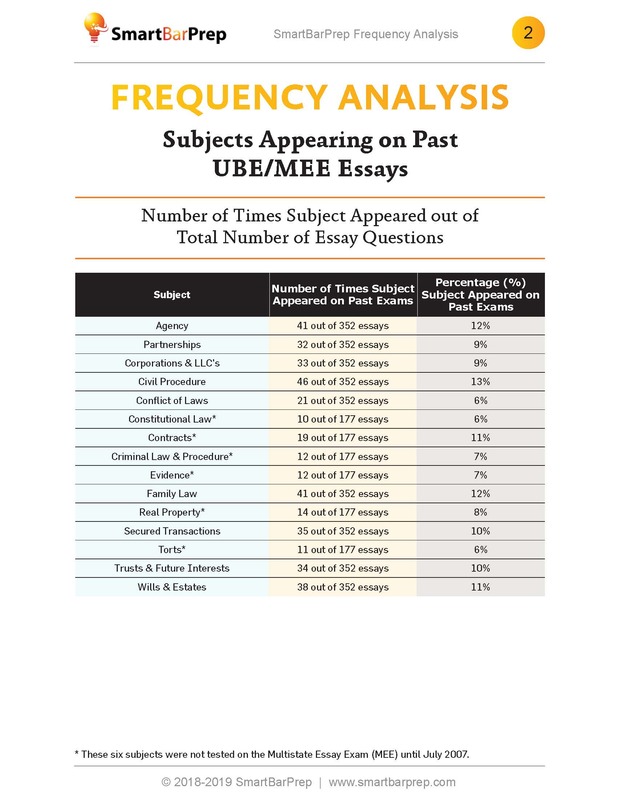 Download Our FREE Frequency Chart to Find Out How Often Each Subject and Rule Has Appeared on the UBE/MEE Essays Over the Last 24 Years! Your study time is limited. Understanding what topics and rules to focus on will help you study smarter and go into the bar exam better prepared. 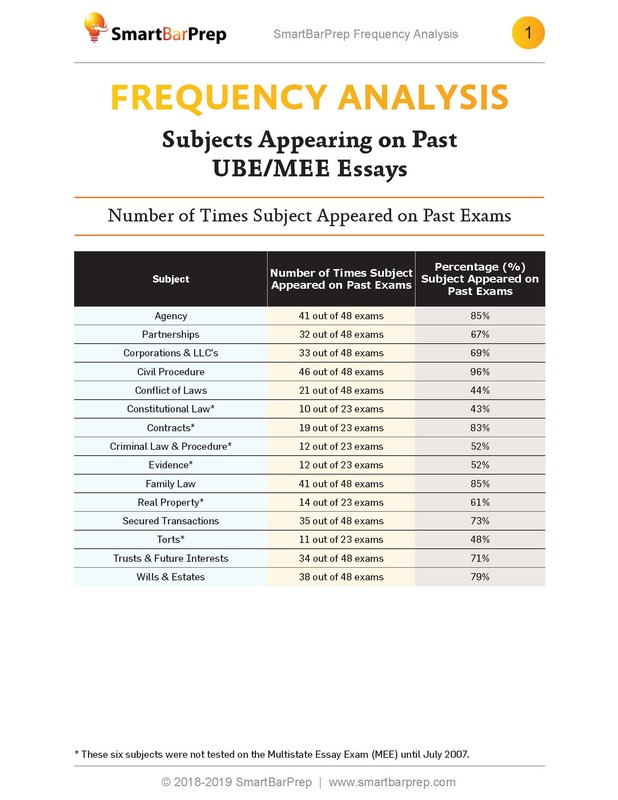 Breakdowns of how often each subject area has appeared on the Uniform Bar Exam/Multistate Essay Exam (UBE/MEE) essays in the past 48 examinations. 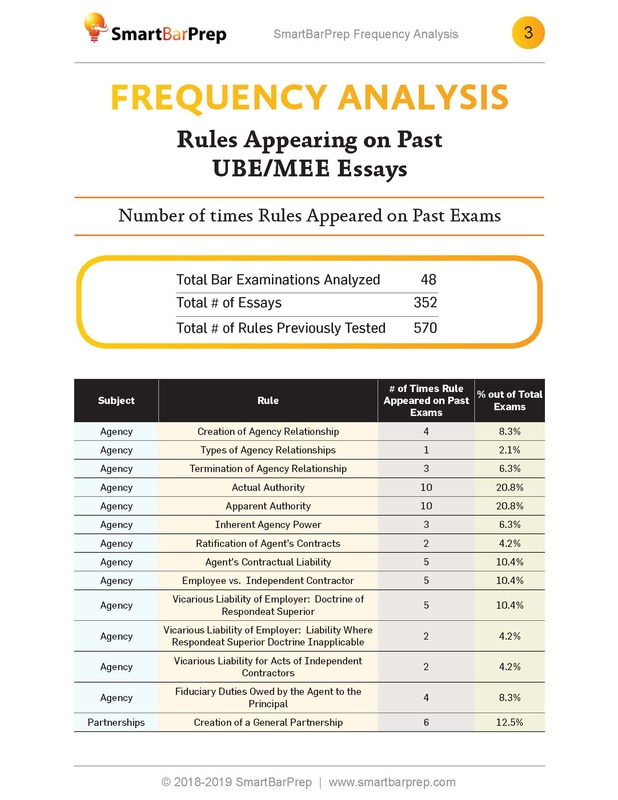 Frequency analysis of all 570 rules tested on UBE/MEE Essays in the last 48 examinations, covering 352 essay questions. Packaged in one convenient, 100% free download. There is no catch. You have nothing to lose by downloading our frequency analysis chart and streamlining your bar exam study. Download it right now to start studying smarter immediately. 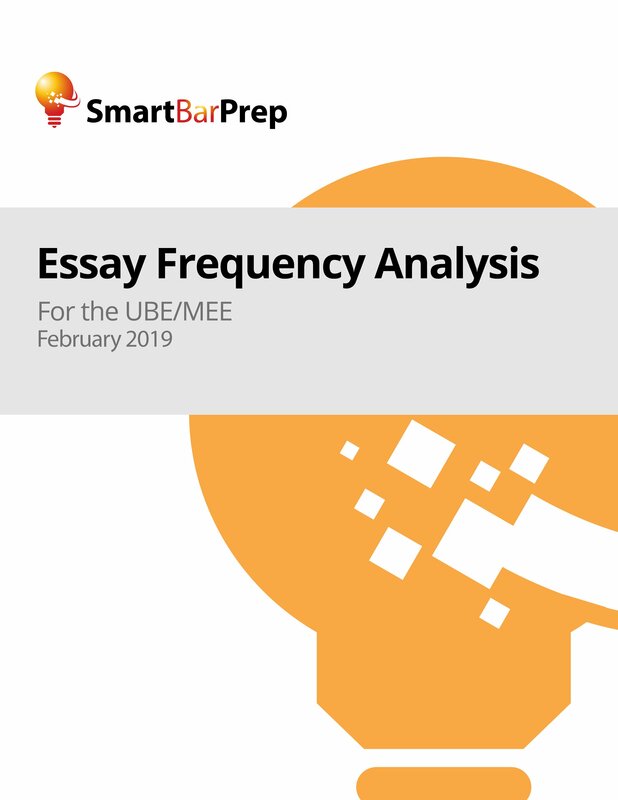 By using the SmartBarPrep Essay Frequency Chart, you can prioritize and study the rules of law that matter most to the bar examiners, gaining a significant advantage over other bar exam takers. Because many topics are repeated from old exams, every person taking the bar exam would benefit from reading and analyzing all past exams as part of their study regimen. These past exams give you an unparalleled perspective of what types of rules the bar examiners test and how often they have shown up in the past. As anyone who has taken the UBE/MEE knows, there is simply not enough time to review and analyze every past exam or every topic that you might be tested on, especially while also having time to study for the MBE and MPT sections. You have a limited amount of study time, and we help you study smarter with our 100% free SmartBarPrep Essay Frequency Chart. Don’t wait. Start studying smarter today.